Add an eye-catching twist to your space with a trendy statement lighting fixture, like this Edison bulb chandelier from Urban Chandy. Replacing just a few elements can go a long way in upgrading a room, and lighting is a great place to start. It seems lately when it comes to light fixtures, bigger is better. Here are some of the current trends we love. When done right, metal fixtures can actually add warmth and personality. Bronze and soft gold are especially sought-after right now. Bronze ball pendants in a brushed or hammered finish seem to be popping up in all kinds of chic spaces. Here, Tom Dixon goes for full shine with chrome. Industrial-themed, forged metal pendants offer a million possibilities in drum, funnel, and dome shapes and in every finish you can think of. This Ignis Pendant from Lumens would look as great in your dining room as it does in this restaurant. Antlers are coming off of walls and now they’re dangling from the ceilings. More art piece than trophy, many antler light fixtures are made of resin. If you fancy the real ones, these from RealAntlerChandeliers.com are beautiful, but a little pricey. Luckily there’s also a company in the UK making beautiful (and affordable) resin antler chandeliers. If you’re a fan of antiques, a salvaged chandelier will make a grand statement to any room. Try searching at architectural salvage dealers, estate sales, or antique stores. DIYers and designers are transforming overturned glass bottles into centerpiece lighting. We love how this one creates a statement in an otherwise bare space. LED lights that actually look cool? Finally, it gets better than track lighting for these energy-efficient lights. This starburst LED chandelier is retro and modern at the same time. 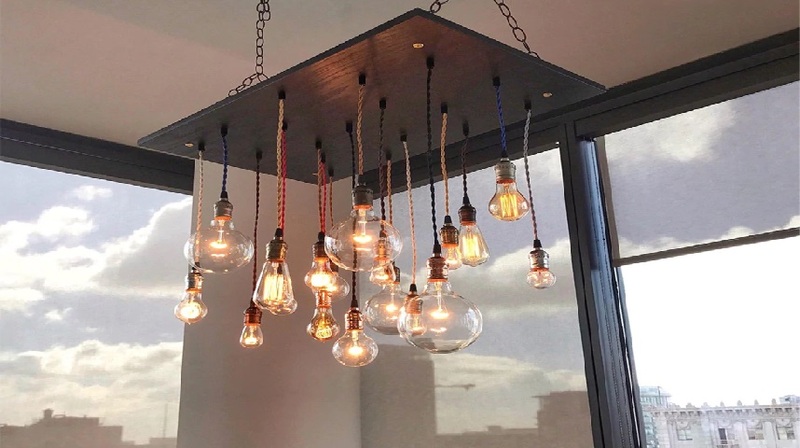 Speaking of throwbacks, lighting is finally following in the footsteps of the retro and mid-century modern furniture craze, as we’re seeing more and more Sputnik-style lamps included in modern collections. Whimsical or unconventional focus objects have become a hallmark of contemporary design like this Ursula lamp or any other curvy shape. Edison bulbs have been in vogue for a few years. With new designs, they’re finally getting some refinement— but not too much.